So much wrong, so little space to rant. Preview does not work (1). Embedded videos no longer preview; only the text for the embedding displays. Preview does not work (2). The “preview” does not show the banner and other attributes as it used to. Selecting a post to “preview” does something that forces you to “update” or “discard” even if all you do is attempt to “preview”. What is getting changed? Keyboard is funky. Undo … doesn’t work. Delete key was inserting newlines. The above is my experience using WP for iOS 5.3.0.2 on an iPad Air 2 with iOS 8.3. Since I am a beta tester for WordPress, one might think I would have seen these problems ahead of time and reported them, but alas every single beta release I have attempted to install over the past few months has CRASHED ON OPEN. I have reported this to WordPress many times, but with no fix suggested. But that is a tale for another time. I maintain my blog exclusively via iPad/iPhone. The new release version is a major set back for me. Maybe this performance is specific to my environment, if so, I am a single unhappy user. But if others are experiencing a similar user experience … how many other unhappy users are out there? How I long for the days when I was happy. It seems so long ago, but it was only yesterday. So Happiness Engineers … I challenge you to once again make me happy. 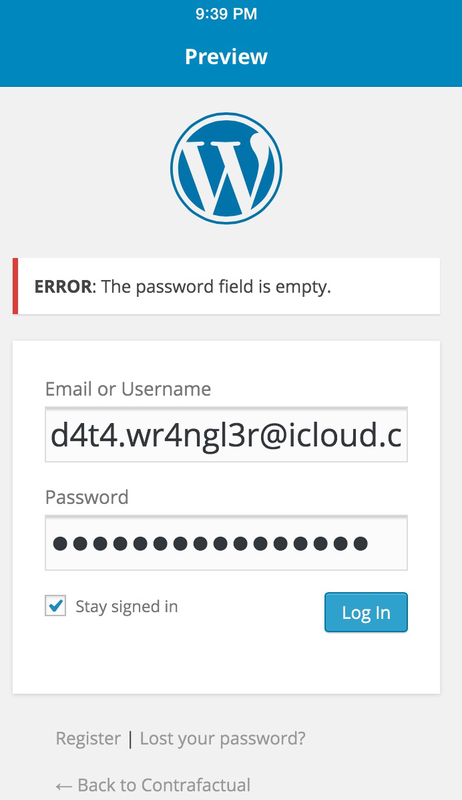 So rather than pasting in the loooooong password I got from WordPress many moons ago, I tried typing it in directly. Ah Ha this new password does not appear to allow spaces (no space bar). My old password supplied by WP had spaces after ever four character quartet (ie. ab1c de2f gh3i jk4l). I uninstalled / reinstalled WP from the App Store. Used my old login ID and password; it was accepted. Preview still does not work. I am still unhappy. OK, this is weird. If I select a “published” post (like this one) it immediately provide the update option. Preview fails with or without updating … BUT if you try to back out and choose Discard the “eye | gear | update” changes to “eye | edit”. Clicking the “eye” yields a correct preview. 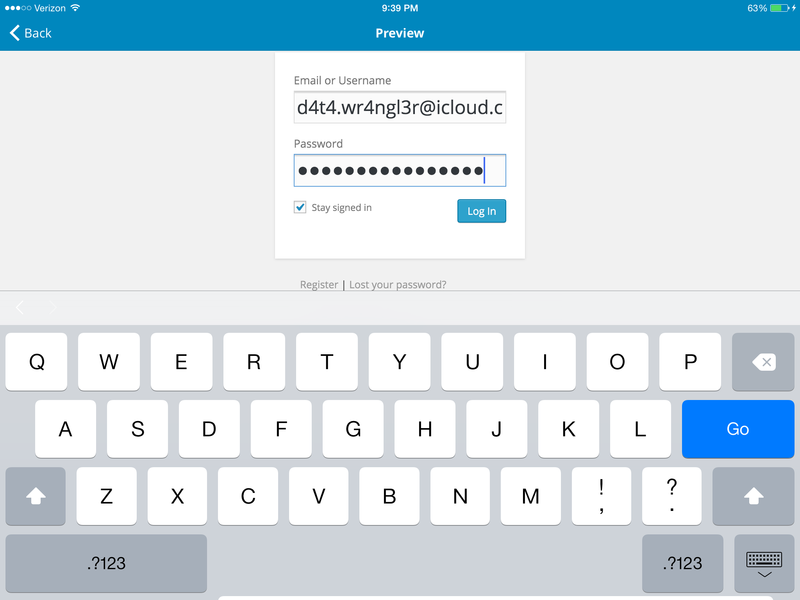 HOWEVER, if you choose a “draft” post and try the same logic you get the “Error: The password field is empty.” dialog shown above, requesting login. So … the functionality is there … sort of … but jumbled and defective. Still not happy, but I do enjoy troubleshooting. All of this has a strange déjà vu to it. Apologizes for the issues you’re having, and thanks for the feedback! We unfortunately let a bug slip into that release, but have addressed the issue in 5.3.1, which is out. Please give that a shot and let us know if you’re still having problems.